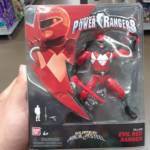 Found by Guadalupe M we have our first look at the evil Red Ranger figure that was previously listed in the Power Rangers Super Ninja Steel 5″ figure line. Every fan assumed it would be the evil Red Ranger version of Super Ninja Steel Red, first seen in the Power Rangers Super Ninja Steel trailer for the last half the season. But now we know it is actually the evil Mighty Morphin Red Ranger robot clone from the 25th Anniversary episode “Dimensions in Danger” which aired this past Tuesday. We have confirmed the legitimacy of the figure with Jason Bischoff from Hasbro. Time to dust off that Power Rangers Super Ninja Steel peg at your local stores to find this guy – we assume he will be in VERY high demand! Happy hunting! Welcome to the craziness that is San Diego Comic Con. 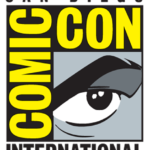 Every year, four and a half days of overwhelming crowds, celebrities, and exclusive toys deck the San Diego convention center leading to a frenzy of news, information, and pictures to digest. This year promises to be no different from last year except for one crucial part – we know there is loads of Power Rangers stuff to look forward to! Make sure to follow TokuNation.com on all our social media so you don’t miss a single moment of the convention coverage! We are proud to bring you yet another year of top coverage of all the biggest conventions with Power Rangers! First off let’s discuss the exclusives, how much they cost, and where you can buy them. – Soul of Chogokin Megazord Repaint – Bluefin Tamashii Nations booth – $? Then let’s look at the panels and/or events that are upcoming as well! 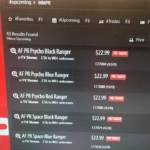 Gamestop Exclusive Legacy Mighty Morphin Armored Red Ranger Now Open For Orders! 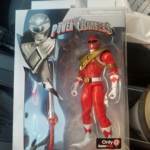 Last month we received a teaser for a new Power Rangers Legacy figure exclusive to GameStop. Now, after much speculation this new Legacy figure is at last available to order! 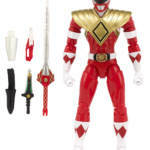 The figure in question is a Mighty Morphin Armored Red Ranger and includes the Dragon Shield, Dragon Dagger, Blade Blaster & Power Sword. An excellent “last-hurrah” of sorts for the Legacy series! Legacy Armored Red Ranger is currently scheduled for release in November 2018! 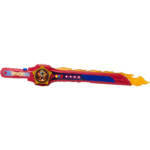 The price is a very modest $22.99 USD before shipping and handling! 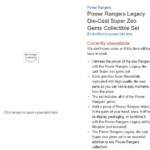 While they never officially announced the the Power Rangers Zeo Legacy Super Zeo Gems, the listing was discovered (and shared) with us via Amazon.com earlier this year. Today on Twitter, Bandai America responded to @PowerRangerTalk stating: “Yeah this one unfortunately isn’t happening anymore. Again, with the changeover a lot of things have been thrown into limbo/taken off the table. The good news is, there are still a few items up our sleeve that we haven’t announced yet that we’re extremely excited about!”. However, they do have some surprises left in store for the Power Rangers line before Hasbro takes over in Spring 2019. Stay tuned for more news and information from Bandai America here at TokuNation! Yeah this one unfortunately isn't happening anymore. Again, with the changeover a lot of things have been thrown into limbo/taken off the table. The good news is, there are still a few items up our sleeve that we haven't announced yet that we're extremely excited about!